The entire west side of a rural Bourbon barn was stolen within the past couple of days, taking with it a vintage Mail Pouch Tobacco advertisement (see bottom of article). BOURBON — The colors had been faded over decades after bearing the brunt of thousands of Marshall County sunsets. But, the western side of a small barn between Bourbon and Plymouth on Old Road 30 had once been a vibrant, early example of roadside advertising. 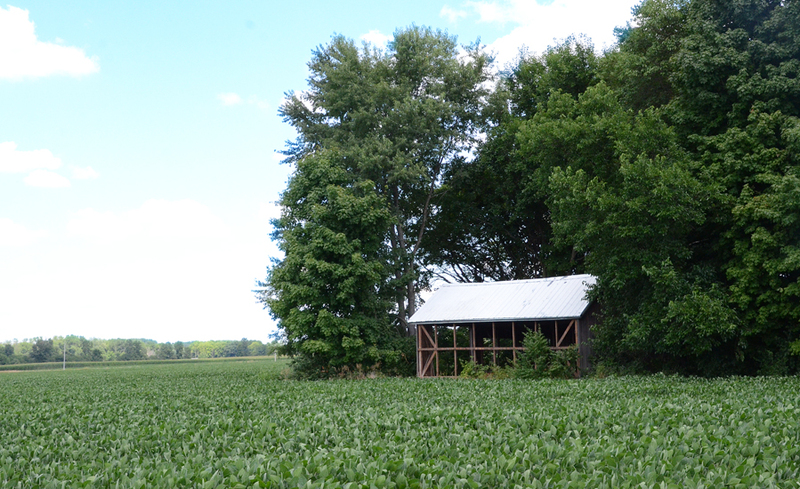 That was before several days ago, when bandits with a penchant for vintage barn wood completely dismantled the isolated barn’s west side, taking with them a decades-old Mail Pouch Tobacco advertisement. The getaway vehicle left impressions in the soybean field. McCollough said his mother has an original receipt from Mail Pouch Tobacco, but doesn’t know when the barn was originally painted. He said the barn has been re-painted several times over the years. He can state, though, that the barn would have had to have been painted sometime after 1928, which he says is when Old Road 30 was first constructed through the area. Karin Rettinger, archive manager at the Marshall County Museum, said she was saddened when she was visited by Judy McCollough earlier in the day on Wednesday, July 18 and learned of the theft. “She was carrying a picture of the barn before the siding was taken,” said Rettinger. “I was always tempted to stop and re-paint that cardinal,” said McCollough, referring to a now faded image of a cardinal on the Mail Pouch logo. Kevin McCollough said he doesn’t know what the motive was for the theft for sure, but barn siding has grown in popularity and barn sides such as the one west of Bourbon are becoming more and more rare. Rettinger theorized that the thieves worked overtime to remove the west side, taking all the planks at once. “My husband and I dismantled a barn once and those old nails are very difficult,” she said. 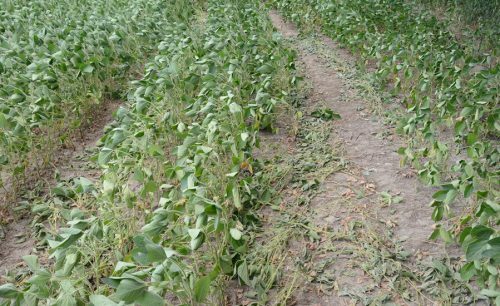 Tire tracks from a four-wheeled vehicle flattened one-foot-wide paths in the soybean field leading up to the barn, clearly showing how the perpetrators made off with the vintage wood. 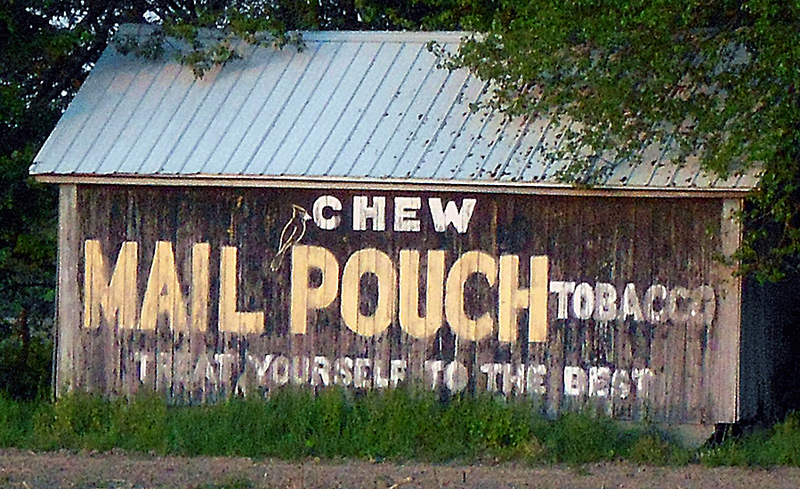 Mail Pouch Tobacco began advertising on the sides of barns in 1891 and stopped painting barn-side ads in 1992. In the height of the campaign, in the 1960s, there were about 20,000 such barns located in 22 states. That Marshall County Sheriff’s Department is interested in any information that can apprehend the thieves. Anyone with information can call (574) 936-3187. Owners have provided a before photograph, showing the vintage ad prior to the theft.